1 of 7 Finely crumble cake into a large bowl. Stir in frosting, pressing crumbs together with a silicone spatula or the back of a spoon to make a dough. 2 of 7 Press a heaping tbsp of the dough into one of the cavities of the Petite Hearts pan. Repeat with remaining cavities. Pop out shaped cakes onto a wax-paper-lined sheet pan. Repeat with remaining dough. Freeze 1 hour. 3 of 7 Place white candy melts in a glass bowl. Microwave at 50% for 1 minute. Stir and continue to melt at 50% in 30-second increments until a few lumps remain. Sir until smooth. 4 of 7 Remove half the hearts from the freezer. Dip a lollipop stick about 3/4 inch into white candy, then insert into cake. Repeat with all hearts. Refrigerate for 20 to 30 minutes. 5 of 7 Reheat white candy melts until smooth. Stir in 1 tbsp of the oil. Dip a pop into white candy and gently tap so excess coating drips back into bowl. Return to wax-paper-lined sheet. Repeat with a third of the cake pops (removing from refrigerator one at a time), adding decorating sugar or nonpareils to some of the pops and leaving others plain. 6 of 7 Melt red and pink candy melts in same way as white ones, stirring 1 tbsp of the oil into each. Dip pops into desired coating and add decorating sugar or nonpareils to some, leaving others plain. 7 of 7 Make a quick icing: Beat confectioners sugar and 7 tsp water in a bowl (this will be stiff). Divide into thirds. Add cocoa powder and a little more water to one bowl; add red gel food coloring to another bowl. Transfer to pastry bags fitted with small writing tips. 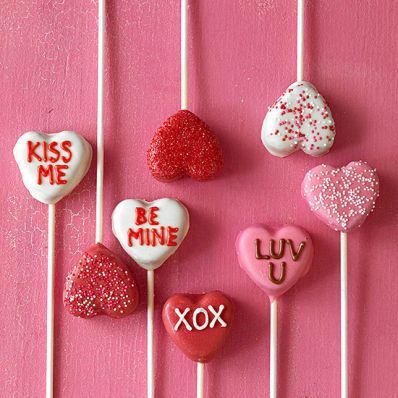 Pipe messages onto white pops in red icing; use cocoa icing for pink pops and white icing on red pops. Let dry.